So you have decided on a new home…. now what? 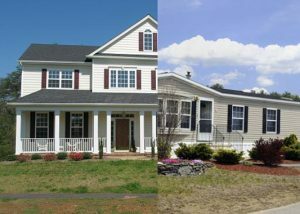 Do you build a home on-site, or purchase a Modular Home? Modular housing is a great alternative to a site-built home, but they are not for everyone. Here are a few things to consider when you are deciding what is right for you from the Modular Housing Association Prairie Provinces! Homes are built to comply with the Provincial Building Core and are subject to the New Home Warranty as per the provincial legislation. Homes are built using “outside-in” construction, where the initial framing is done first, followed by internal components. Homes Built outdoors in all weather conditions where materials are exposed to weather elements are where the home site is also exposed to potential vandalism and theft. Generally, one general contractor will have a number of projects on the go at the same time. The coordination of trades is a challenging and time consuming task during site-built construction as they must travel between construction sites to set-up equipment and preform their duties where weather, equipment transport and other factors can lead to expanding timelines. Though the general contractor may utilize particular trade workers from job site to job site, there is no clarity around their training consistency. Inspectors must be called by the general contractor at each stage of construction, however, the contractor must wait to continue construction until the inspector schedules an appointment to inspect and approve what has been created thus-far prior to moving on with their processes. Homes are built to comply with the Provincial Building Code where they will be placed and are subject to the New Home Warranty Program as per their provincial legislation and the individual manufactures’ warranty. Homes are built using the “inside-out” construction, where the internal components are built first, followed by connection the outside framework. Homes are built in controlled conditions (indoors) where materials are protected throughout the building process from both weather and potential vandalism. An internal quality control program & continuous monitoring are used throughout the building process. All trades are highly skilled and trained on in-house assembly processes, thus allowing for superior building consistency. All materials and tools are available and at the ready of workers at each work station, allowing for minimized loss of time for walking, set-up and down-time of equipment. Due to the use of assembly processes, precision work and attention to detail are inspected at each stage of construction.